If there's one thing Master J loves to do more than any other messy activity, it's play dough! He loves to squash it, smash it, pull it, poke it, roll it and jab it! He will happily spend a good 30 minutes totally engrossed in a blob of play dough and a few cookie cutters. I decided to extent his play with a little educational aspect to it. He might be a little too little yet for a lot of numbers, but it never hurts to start introducing them into his play. The idea for the gumball machines actually came from Miss L, who helped me design them in Photoshop, and picked out the colours! She has some more ideas, and so do I, so you can expect to see some more throughout the year. Play dough mats are a fantastic resource for kids. They encourage learning while having fun, and add extra play aspects to their activities. The mats are laminated too, so they can be re-used again and again! 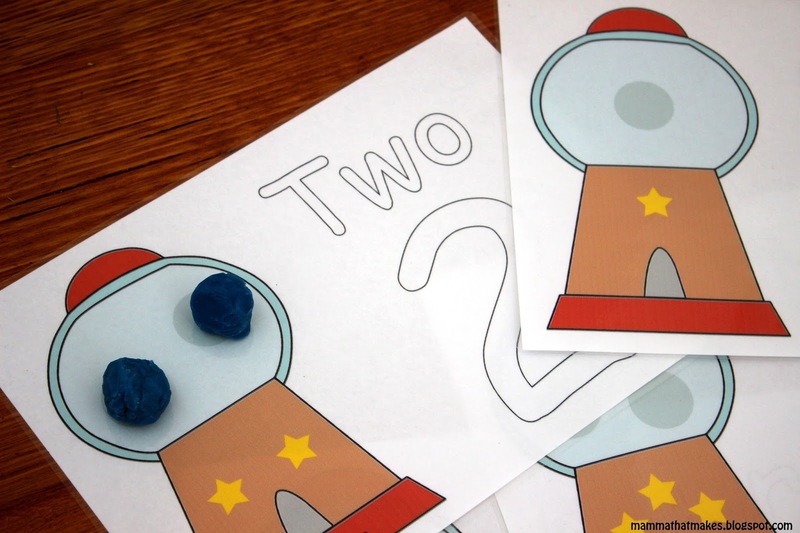 Right now, he just has fun putting play dough blobs onto the shadows in the gumball machines, and doesn't seem too concerned about the numbers. He is, after all, only just (as in last week!) 3. But eventually we'll swap them out for a set without the shadows. 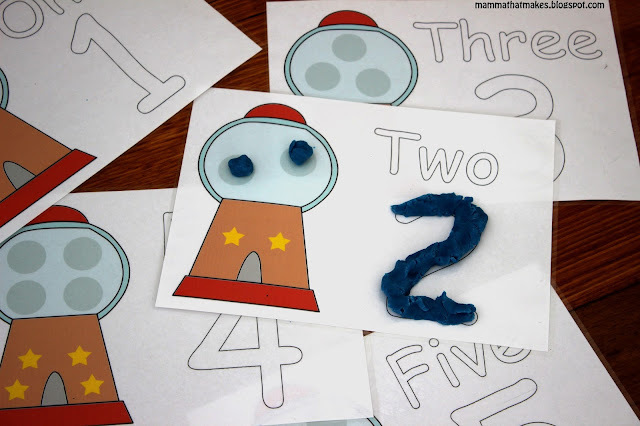 The set has numbers 1-5, we'll eventually add to 10, but 5 seemed like a good starting point for his age. We're also going to use them for placing pompoms on with a pair of tweezers, to help with his motor skills! 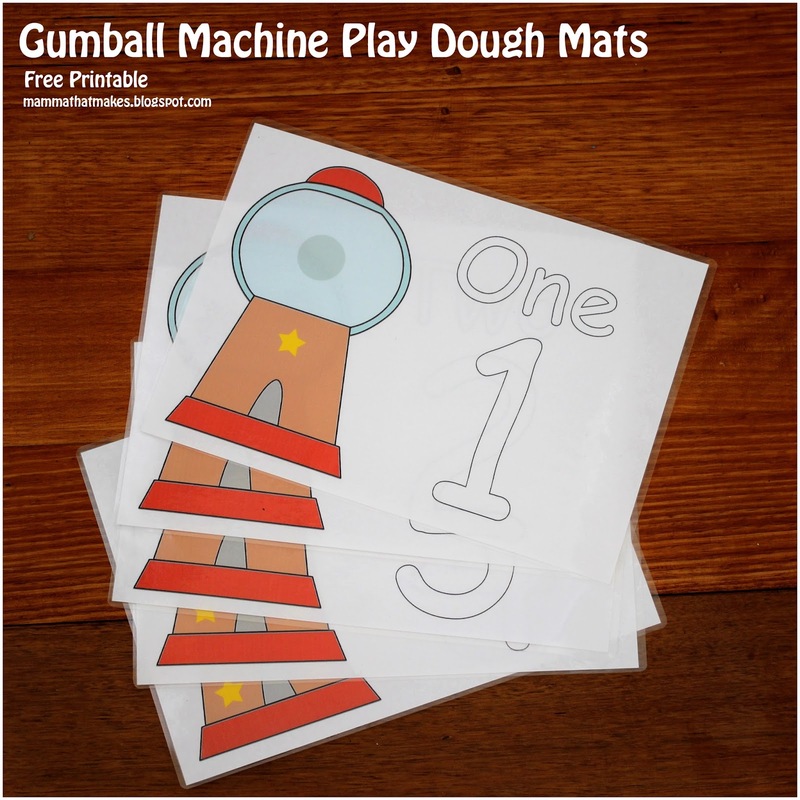 Simply save, print, laminate and play! Great idea. There are so many natural fun ways to expose kids to basic concepts without making it kill and drill. They are learning the important stuff so they will know their numbers, but they had a great time doing it.